JOIN US AS WE LAUNCH THE PENULTIMATE BEER OF THE VERMONT CHAPTERS: MANGO MASHER! In baseball, the term ‘Masher’ is used to describe a player who consistently hits home runs. 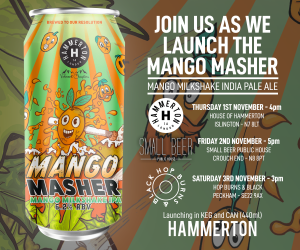 Well, we think we’ve knocked it outta the park with this Mango Milkshake IPA. With 60 kilos of fresh mango, an abundance of oats and wheat, and dry-hop additions that portray stone fruit characteristics result in a beautifully juicy IPA! House Of Hammerton – Thursday 1st Nov 16:00-23:00 – Our spiritual home. It wouldn’t make sense to kick it off at any other place than our very own pub. Small Beer Crouch End – Friday 2nd Nov 17:00-23:00 – We love these guys, and when we were deciding which other site in North London to host our launch, they were top of the list. There’s always great beer on offer and a lovely, friendly team. Hop Burns & Black – Saturday 3rd Nov 15:00-21:00 – These guys are really, really good at hoarding (and occasionally selling…) really cool stuff. If over 350 different beers wasn’t enough, they also some awesome vintage vinyl and London’s best selection of hot sauces! Yes, the name starts to make sense now doesn’t it!? Can’t wait to spend a Saturday chilling with these guys in Peckham.